Many of the articles you're going to be reading on cars over the next few months are going to be based on how our finance minister's new budget is suffocating the industry. But I'm not going to go there simply because it makes no difference whatsoever to the cars you see here. In fact it might even work in their favour, what with popular budget SUVs set to get more expensive people might start looking a little harder at this segment of hatchbacks and sedans. Now Chevrolet's new Sail U-VA has been around for a couple of months and we've brought you the in depth word on the car. 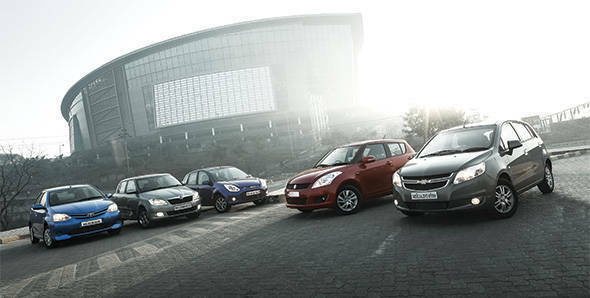 All that's left is the final verdict against four of its big diesel rivals - the Skoda Fabia, the Toyota Etios Liva, Ford's Figo and the Maruti Suzuki Swift. The Sail isn't going to win any beauty awards but its boxy dimensions do guarantee one thing  space. And plenty of it. It's one of the longest cars on test and has great interior space. It offers great shoulder, leg and head room and would have been the most spacious if it wasn't for the Liva. The large windows offer great visibility as well. The dashboard itself is smart with plenty of flowing and swoopy lines but it is let down by the drab looking silver finish arrangement of all the buttons and knobs. There's a nice looking instrument cluster that uses both analogue and digital meters like a motorcycle. Unlike most motorcycles the speedometer is analogue while the rev counter is digital. That wouldn't be a problem except that the read out is in decimal points, for example 2.2 for 2200rpm. This isn't very useful and gets very distracting to do a quick mental calculation every time you want to see what revs you're doing and have these constantly jumping numbers right in your face. The aircon itself works very well but the illumination in the buttons is so dim that you can't really tell whether the AC is on or off in the day. The smartly designed steering wheel has two small horn buttons engineered into either side and they feel nicely ergonomic. Unfortunately the materials used feel very plasticky and this isn't the best feeling wheel on test. In an effort to save costs Chevy (or rather SAIC, their Chinese partner who designed the Sail with GM) has positioned all four power window switches at the base of the centre console which isn't really a problem but takes some getting used to. In terms of sheer space the Liva blows the completion away. Toyota has managed to engineer massive amounts of air into the Liva's cabin and it offers the most rear knee room and the most shoulder room. A flat rear bench means you can comfortably seat three abreast at the rear. The thin front seats have a lot to do with the extra space at the rear but they don't skimp on comfort and this is one car you could drive effortlessly all day long. Unfortunately for the Liva that's where the good news ends. While the exteriors aren't striking they have a likeable and honest old school feel to them that's accentuated by the optional body kit you see here (standard on the Liva Sportivo edition). Sadly the theme doesn't transfer to the interiors. The dull grey and black interiors look and feel plasticky and would have been acceptable on a car that cost about Rs 4 lakhs but the Liva you see here doesn't. It costs nearly double that. Its the only car without a rev counter but the major omission, is the lack of a sound system; no matter what the variant you buy. I also discovered a flaw with the aircon vents on our drive to Goa in the Etios (identical cabin layout). Having both the middle vents on the left side of dashboard means the driver gets a chilled right hand thanks to the close proximity of the driver's side air vent. But your left hand is left hot and sweaty because the centre air vent is simply too far away to be as effective. It's an interesting design detail but not a very effective one over longer drives. However Toyota have just released the new 2013 Liva as this goes into print and that car gets beige dual tone interiors and a 2-DIN player on the top end variant. Of course the revised prices will reflect these additions. Besides that the interiors remain largely the same. When the Fabia was first launched about five years back it justified its steep price by offering an upmarket feel that none of its competition could match. It was one of the first premium Euro hatches and gave the buyer the sensation of driving a downsized Octavia or Laura. Over the years the competition has moved significantly forward but the Fabia hasn't. The interiors still use great materials and build quality is top notch but the overall layout is starting to look dated. Even the sound system, which is a Skoda strong point doesn't quite match the acoustic quality of the Swift or Figo's systems. However, full points to the Fabia for being the only car with rake and reach adjustable steering which along with a height adjustable driver's seat makes it very easy to find the perfect driving position. The Fabia also makes up for a cramped rear bench with the biggest boot/hatch on test. The new Swift was launched in 2011 and it transformed what was a very good driver's car into a very good car overall. Space was liberated on the interior which is now manageable instead of cramped. The layout and quality of materials used in the dash leapt ahead. The car, even today feels very well built and you get the satisfying sense that you're really getting what you're paying for. The damping of the buttons and switches, the quality of the sound system  it all feels very well put together in a well designed layout. The driving position is spot on with a comfortable and sporty seat. The Swift's only downside is that it isn't quite as spacious as the other four cars. With the driver's seat adjusted for Varun's 5'11'' frame there was slightly more rear knee room than the Fabia but not as much as the other three. The boot while deep is narrower than the others and also has a smaller loading window. The new Figo gets its entire dashboard lifted off the Ford Classic (old Fiesta). It's practical and well laid out with chunky and easy to use buttons. It might not have the visual appeal of the Swift but it's very functional and there's no complaint with the quality of materials. The Figo has an excellent sound system and Ford have also introduced audio controls mounted behind the steering a la the Renault Fluence/Duster. The problem is that Ford has positioned it too far and too low. This means you have to hook your left thumb on the edge of the wheel and stretch with your finger tips to use it. I also found my left knee periodically hitting it when I got off the clutch. Not very ergonomic. On the plus side, the Figo offers excellent seats, second only to the Swift and also great all round visibility thanks to the large green house. Height adjustable seats would have been nice though, nevertheless the car has a good driving position. The only sore point is that you still can't get power windows at the rear no matter what the variant. Come on Ford, you offer a car with ABS, airbags, Bluetooth connectivity and other goodies but no rear power windows? The only engine sharing in this test is between the Sail UV-A and the Swift, both of which use Fiat's superb 1.3-litre Multijet diesel. Chevrolet has tuned the engine to produce 78PS at 4000rpm and 205Nm of torque at 1750rpm. That's more power and more torque at a lower rpm than the Swift and as a result the Sail has a healthy bottom end. Coupled with a snappy, short throw but slightly notchy gearbox the Sail was easy and pleasant to drive in start-stop city conditions despite the slightly springy and long travel clutch. Overall performance is fair with a 16.16 second run to the ton and a top speed of 163.1kmph. Efficiency stands at an overall 17.2kmpl. Toyota's 1364cc engine produces a lower 68PS of power and 170Nm between 1800-2400rpm. The engine has a great bottom end with a flat torque curve which makes for a very linear power delivery. The clutch isn't light but neither is it as heavy as the Fabia's. Refinement levels aren't as good as the others and the Liva makes the most audible diesel clatter. It doesn't like to be driven hard, but if you must the Liva takes 17.3 seconds to 100kmph and tops off at 159.9kmph. That makes it the slowest car here. Overall efficiency is a high 17.88kmpl. The Fabia is the only car here with a 3-cylinder, 3 valve/cylinder engine. But it's not underpowered, making 75PS and 180Nm and it isn't unrefined either. In fact it's a free revving and refined engine. The problem, and it's a big one, is turbo lag. The Fabia doesn't really do much until you cross about 2000rpm after which it takes off and races to 4000rpm before the power tapers off. The issue is amplified by the heaviest and springiest clutch on test and the fact that there's considerable drivetrain lash. The car gets jerky unless you get off the throttle with utmost care. All this makes the Fabia frustrating and tiring to drive over extended periods in traffic. The car takes 16.9 seconds to hit 100kmph while efficiency is 15.9kmpl overall. The Swift makes less power and torque than the Sail (75PS and 190Nm) but it's still the quickest car here. 100kmph comes up in 14.03 seconds and top speed hovers around 166kmph. Efficiency is right with the others at 16.68kmpl. There is turbo lag but it isn't restrictive and the car is still very easy to drive in city conditions thanks to an easy modulating clutch, well placed pedals and a precise short throw gearbox. Highway cruising is relaxed with enough power on tap for overtakes even at about 120kmph. The Swift is easily the quickest but it's also efficient and has a solid midrange. The 1399cc, 8 valve, four cylinder diesel in the Figo is another straight lift from the Classic and it makes identical power and torque figures of 69PS and 160Nm. This translates to superb drivability, great low end performance and very good refinement. Sure the engine isn't a rocket ship but then its also so dated its almost prehistoric. Significantly though this car is based on an old generation UK Fiesta from the early 2000s. But don't let that get to you. Shift quality though is great, right up there with the Swift, if not better. The clutch is light, easy to modulate and this car was one of my favourite to drive. Performance numbers are reasonable and the Figo takes 16.1 seconds to 100kmph and tops out at 150kmph. It is however impressively efficient and return 17.2kmpl to a litre of diesel. You probably already know this but the Sail rides very well; it's one of the cars best features. The suspension swallows uneven and broken roads and only gets slightly fazed when it encounters the worst potholes. The car is a good highway cruiser and is happy at about 120kmph but the light steering starts to get vague after that and stability starts to drop. The car is perfectly adequate on winding roads but don't expect any adrenaline pumping dynamic ability  the Sail simply wasn't built for that. Like the Sail the Liva also rides very well but the problem here is sound deadening. You see the Liva doesn't quite mask road noise as well as the other cars here. This means you hear more of the imperfections in the road than you feel which leads to the perception of poor ride. Some sound deadening in the wheel arches would really help things. The Liva is one of the softest cars on test and there is considerable lateral weight transfer. However like the Etios, it grips very well and you can throw the Liva around corners with surprising speed, but it isn't a very pleasant sensation thanks to the body roll. The Fabia has the stiffest suspension set up here and it's also an excellent handler. Good steering feel and excellent chassis balance makes it a nice handler. Lift-off oversteer on the limit moves the rear around predictably which makes things entertaining but easy to control. At low speeds the Fabia's ride quality lies on the stiffer side of supple. There's nothing to complain about and it doesn't crash through the bad stuff but it doesn't exactly soak it all in either. High speed stability is excellent and the Fabia is rock steady even as the speeds cross 150kmph. The Fabia brings up the rear in this test. It's not the best car to drive and its the least efficient and while it felt more premium than its rivals it doesn't anymore. And it really doesn't justify its high Rs 9 lakh (on road Mumbai) price tag. Next is the Liva. It's the widest and most spacious car with good ride quality and is a well engineered product under the skin. Unfortunately it has the most basic interiors and could do with better sound dampening. The problem with the Liva is that you're constantly reminded of the fact that the other cars have much better interiors and feel like much nicer places to be in. The Sail is perfectly in the middle order. In terms of styling, interiors, the driving factor and even the price  the Sail UV-A fits right in the middle. Like all the other cars here the top end variant gets vital safety features like ABS and airbags. Overall it's a completely acceptable vehicle that does what you ask of it but it's just not very desirable. The Figo was the surprise in this test. It is the most affordable car here, has some great features and is a pleasure to drive. It's also the first Ford in the country with affordable sales and service costs. It gives the Swift a proper run for its money but loses out on a few factors. For example the lack of rear power windows is a glaring omission and while it has great drivability it lacks the Swift's outright punch, Ford definitely needs to revise its engine! And that leaves us with the Swift. Let's get its one negative point out of the way first  it's not the most spacious car here compared to say the Liva or Sail's sheer space. If you can live with that and the smaller boot the Swift makes a fantastic buy. It looks good, has a nice interior and a great feature set. Also, it's fast, fun and efficient and has the best ownership experience. Service costs and spares are very affordable and Maruti has a massive service network. Resale values on diesel Swifts are also sky high The Figo is about 80 grand cheaper than the Swift which makes it super VFM. But the Swift beats it in vital areas and is quite simply the best car here. Which is why it's the second best selling car in the country today right behind the Alto.